With so many exciting things to see in Cancun, it can be extremely hard to narrow it down to the must-sees. You of course want to see the most amazing and important things without missing out on anything. Let us show you the best tours to take in Cancun. Out of all of the islands surrounding Cancun, Isla Mujeres is the one you can’t miss. This Island is filled with the white sand that you love to walk along and offers calm waves for you to swim in. Board a double-decker catamaran and sail off into this paradise. Enjoy a lunch buffet with open bar and live music all day with private beach club access, and then explore downtown. With nearly everything provided on the island, the only thing you will need to bring is your beach gear and money for souvenirs. Book this tour now! If you want to explore Nichupte Lagoon as much as the Caribbean Sea, then you are in luck! 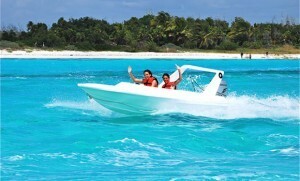 The Cancun Jungle Tour will let you discover both the lagoon and ocean by yourselves in a speedboat. Explore the Mangrove forest and land at Punta Nizuc National Park, where you can enjoy snorkeling and wander the park. The best part is that you are in charge of your boat and can discover as you please. Make sure to bring a swimsuit and change of clothes for this adventure. Book it now! One of the Seven Wonders of the World awaits you in the Riviera Maya, and we can’t let you come to Cancun and not experience this amazing site! 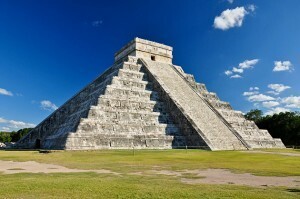 Come see everything from the famous pyramids to the ancient Mayan Ball Court. If you are lucky, you may even experience the Spring or Fall Equinox, when the Mayan feathered serpent god descends the steps of the pyramid an image created through sunlight and shadows. For this trip, you will most certainly want to bring a camera and comfortable clothes. Book this tour now! There are plenty more things for you to see and experience in Cancun and the Riviera Maya; however, we suggest you start with these. If you haven’t booked your Cancun vacation yet, don’t worry. You can book here.